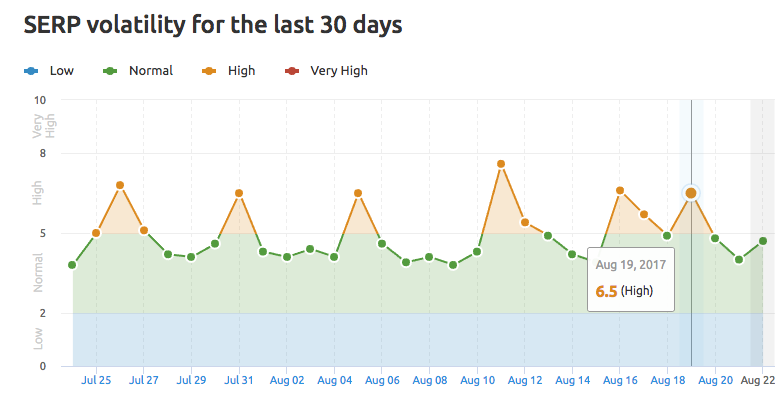 Starting over the weekend, mostly Saturday and Sunday on August 19th and 20th, there were some chatter in the webmaster channels around Google fluctuations in the search results. The chatter was intense for a day or so and died out a lot since then, but there was chatter. Both WebmasterWorld and Black Hat World both had chatter around a weekend Google update. But like I said, the chatter mostly died down since, although the black hat forums are more "chatty" about it. The threads are talking about both personal ups and downs in the Google search results and also overall lack of quality in the search results over the weekend. Some of the tools show a spike of some sorts near the weekend, not that I fully trust the tools but it is good when measured against the chatter in the webmaster community. To be 100% clear, the chatter is very limited compared to large updates but there is chatter and the tools do correlate to the chatter. Did you notice ranking changes and traffic changes from Google since the weekend?